Staff from food industry companies joined the fieldwork on December 8, 2012. 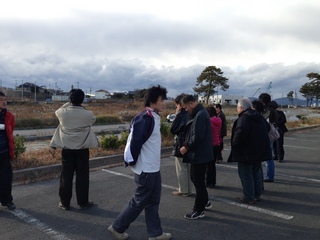 Bridge for Fukushima > Learning Tourism > Staff from food industry companies joined the fieldwork on December 8, 2012. Most of them were related to Fukushima and actively discussed approach to reconstruction. In the morning, they visited farmer’s and fish market of “Soma Haragama Asaichi Club” and Soma base of BFF. They gradually became to realise what were issues in Soma through listening to people and looking at recent condition. 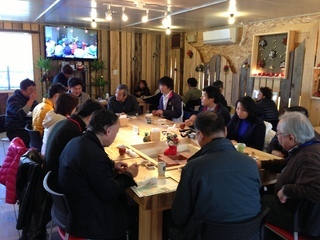 They enjoyed fish meal at a restaurant, Hotokuan, a symbol of reconstruction. In the afternoon, they visited Odaka district and listened to the talk about life after the earthquake from high school students and teachers.